Product Description Hot Wheels Color Shifters Blaster Playset You can transform or customize your Color Shifters vehicles and launch them into action. Set comes with a cool spray gun, self-contained transformation unit, customization tanks and cool car launcher. Not for use with some Hot Wheels vehicles. Ages 5+ years. 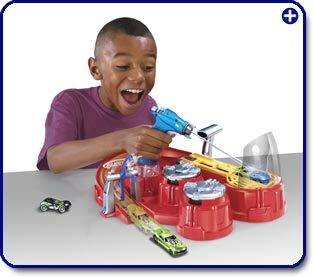 Packaging: 18" x 3.5" x 10" The Hot Wheels Color Blaster play set allows you to instantly change your car's paint job with just a squirt of water. Designed for children ages four and older, the play set comes with a special "Color Shifter" car that changes color when washed with hot or cold water. Drench it with the spray gun or dip it in one of the playset's dunk tanks, and watch it change colors before your eyes. The Good: Simple for kids to use; does a good job of containing stray water. The Challenging: Must be used outdoors; other color-changing cars have to be purchased separately. In a Nutshell: An enjoyable, wet play set for any Color Shifters collection. 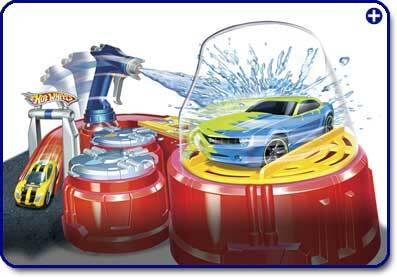 The Color Blaster functions like a miniature water park for your Hot Wheels cars. It is constructed from sturdy, durable plastic. The car-spraying platform is grated and sits atop a basin for collecting stray water to reduce the mess from spraying the car. Still, parents should keep in mind that this is a wet toy, and it is best used for play outdoors. With all of the waterworks, this play set helps make the most of color-shifting cars. It comes with a removable spray gun, which can be used to spray the cars with bursts of water. Also included are two removable, easy-to-fill reservoirs that hold hot and cold water. Dip a Color Shifter halfway into one of the tanks to create a striped effect. Once the color shift is complete, kids can pull a lever on the side to make the car race down the winding red ramp. The playset comes with one Hot Wheels Color Shifter car. Like all Hot Wheels cars, it is fast and expertly crafted, but with a difference -- it changes colors when exposed to water. When sprayed with cold water, it changes from neon green to an icy blue. The original green color can be restored with hot water. Please note that the cold water will have to be close to ice-cold -- lukewarm water will change the car back to its original color. There are dozens of other Color Shifter cars available from Hot Wheels to add to the play set including a color-changing Lancer Evo, and an undercover police cruiser. Whatever the car, the Color Blaster station provides everything kids need for fast color changes as they play. Color Blaster play set, 2 removable reservoirs, spray gun, and Color Shifter car. With two dunk tanks and a squirt gun, this play set helps you make the most of Color Shifter cars. Just add water, and the car magically changes colors. View larger.